We at CMR Group feel extremely privileged to have been able to provide manpower resources to drive the country’s growth engine. CMR University has placed thousands of students in various companies since it was started. The Placements, both for final jobs and Summer Internships is an integral part of any University’s annual calendar of activities. CMR University has a well laid-out systematic process of meeting student’s career aspirations and corporates expectations. 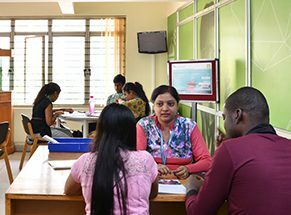 The Placement department functions as a bridge between the University’s Schools, Industries and Students. The Placement activities are for the students and by the students. The process is transparent and commences with the uploading student’s profiles on the placement portal. Each student, faculty coordinators and Training and Placement officials have access to the portal. The leading companies from all sectors are invited by the Placement Department on the campus, where the eligible students are facilitated to go through the entire selection process. The entire process is governed by the student’s ability and performance, as well as the requirements and norms of the Industry. We leverage human capital for competitiveness by nurturing knowledge, entrepreneurship, and creativity. We believe it is these strengths that will help us successfully compete in a globally and exploit emerging opportunities. We reward the will to succeed and the desire to compete with the best in the world. In today’s dynamic and challenging business environment, the Career Guidance & Placement Bureau continues to work closely with industry fraternity, delicately balancing an appreciation of their customers’ expectations with expectations of our vibrant students.